Teardrop campers are available to rent for use at Indian Trails Campground, or take it on the road for a weekend or a few weeks for a long vacation. We rent teardrop campers from TCTeardrops exclusively because of the craftsmanship, quality and service provided by TCTeardrops. Careful now, if you try one, you will probably want to buy one. When it’s raining on your tent, try our “no more tears” option of a Teardrop Camper by TC Teardrops. 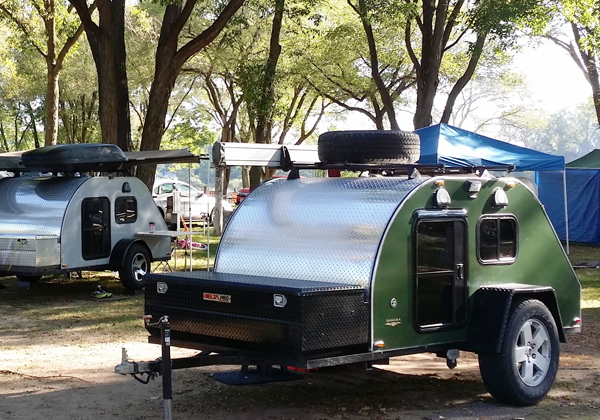 Rent either a 5×8, 5×9 or 5×10 teardrop camper. It’s perfect for those who want to be off the ground, stay dry, and be comfortably cozy. It has a galley kitchen in the back, a cooler(16″x 30″), 12-volt heater, 12-volt fan, LED interior lighting, fox wing awning, portable LP camping stove, portable LP grill, two 2lb. LP tanks, 12V accessory plug, power cord for RV electrical hookups, 30A to 20A adapter, spare tire & scissors jack, lug wrench, ball mount lock, coupler lock, Lynx leveling blocks & chocks, two rugs, solar charger for deep cycle battery, Custom Verlo Mattress with waterproof cover, Yakima roof rack and plenty of room for your gear. Reservation deposit = $98.00 plus tax due 30 days prior to use. Reservation deposit is applied to the daily rental fee when the unit is picked up. Deposit: $500 cash or credit card deposit required for all teardrop rentals, both on-site and off-site. No pets and no smoking in teardrop trailers. Enjoy the day with Early Arrival 9:00 a.m. to noon for $20 if your site or/and teardrop is available. Stay and Play with a late checkout (till 8:00 p.m.) for $20 if your site or/and teardrop is available. Sleeps 2 adults. 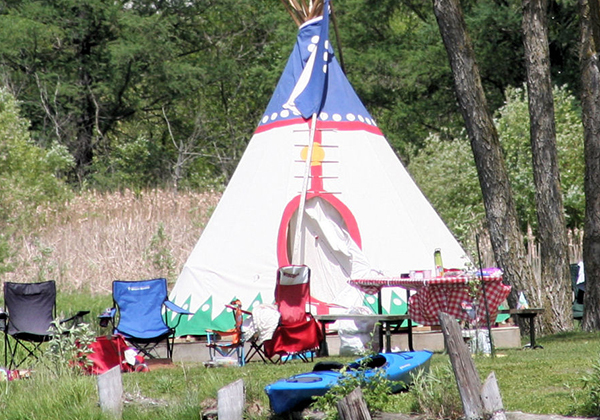 $55 per night when used at Indian Trails (site fee extra). Sleeps 2 adults. $52 per night when used at Indian Trails (site fee extra).